Minnesotans will put anything on a stick. Pickles, walleye, and deep-fried Twinkies have all be stuck on a stick. Mac ‘n Cheese? No problem. Just batter balls of that stuff, fry them up and skewer them. A few years ago when our Governor was running for re-election he even put pictures on himself on a stick. It’s what we do. So when I came across this post on Tastespotting I knew I had to try it. I added some crushed candy canes to a few of them for some seasonal flair. Eat as is or stir into some warm milk. Or maybe make some homemade graham crackers (another goal!) and sandwich this between them for the ultimate s’more. You will not be disappointed. Those look awesome, plus you are a very good writer. I thoroughly enjoyed reading your blog. Such great writing, does a mother proud. See you around the fabric store. Also, did you make these marshmallows? Maybe it’s time to tackle those again! So I’m off to the store for gelatin, how does the chocolate coating work? Do I just melt some chocolate and dip them in? 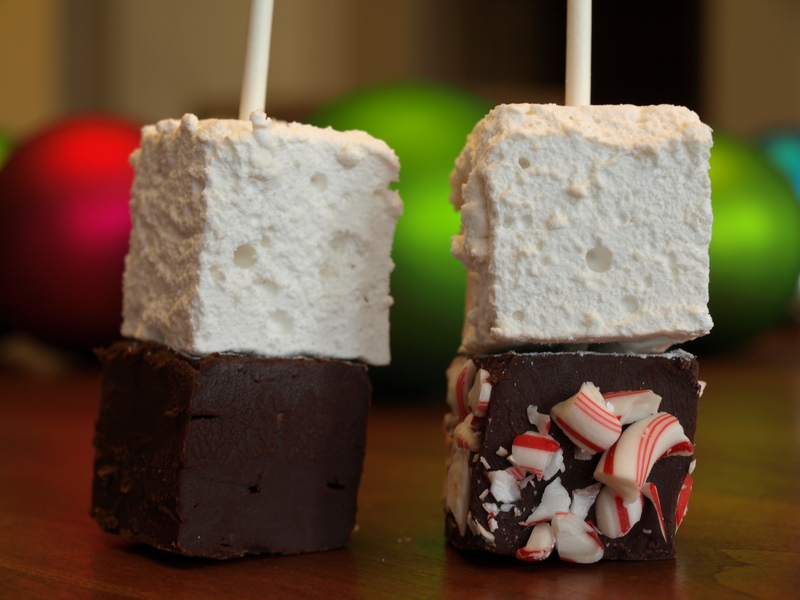 Jess – The bottom part is actually fudge, not dipped marshmallows, though I’m sure that would be fantastic! Check out the recipe, here: http://www.foodiewithfamily.com/blog/2009/12/02/hot-chocolate-on-a-stick/. If you wanted to dip the marshmallows in chocolate coating I do not see why that wouldn’t work. Let me know how it turns out! Thanks!